Tim Minchin · Heads-up Australia! 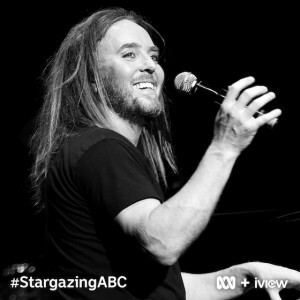 ICYMI – Tim’s joining Professor Brian Cox and Julia Zemiro for Stargazing Live, May 22nd, on ABC! Heads-up Australia! ICYMI – Tim’s joining Professor Brian Cox and Julia Zemiro for Stargazing Live, May 22nd, on ABC! Tim will be joining Professor Brian Cox, Julia Zemiro and a team of scientists and space enthusiasts on Tuesday May 22nd for ABC’s 2018 Stargazing Live. Broadcasting live around the country from Australian National University’s Siding Spring Observatory (SSO) in New South Wales, the programme will air across three nights on ABC and ABC iview at 8.00pm AEST, 7.30pm ACST, and 6pm AWST on 22nd, 23rd and 24th May 2018. Stargazing Live will also be streamed live on the ABC TV YouTube channel and ABC TV Facebook page. You’ll find heaps more information, images, ways to watch and get involved on the Stargazing Live website: abc.net.au/stargazing. Episode 1 is now available on ABC iview, but only for a month, until 22nd June, 2018. Tim popped into the Cosmic Vertigo | Stargazing Special podcast to talk about what gives him cosmic vertigo. You can download or subscribe here.